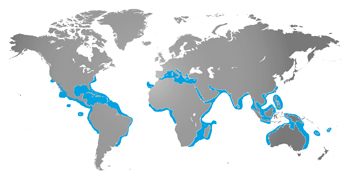 Blacktip reef sharks live in mainly shallow waters, especially in coral reefs and shallow lagoons of the Indian Ocean and Central Pacific Ocean. At the Fort Wayne Children’s Zoo, you can find blacktip reef sharks in the Great Barrier Reef Aquarium. 70% of the shark’s brain is devoted to their sense of smell. Blacktip reef sharks’ diet consists of fish, squid, octopus, and crustaceans. These sharks rarely attack humans. The shark’s sleek body is light brown or grey on top and white underneath. Black tips on the fins give these sharks their name. They have a round nose, oval eyes, and long, serrated teeth. Blacktip reef sharks are active both during the day and at night. These timid sharks are powerful swimmers. They are not aggressive, and they usually swim alone or in small groups. Blacktip reef sharks follow the tide in and out, searching for food. The zoo recommends the Seafood Watch app for help in making sustainable seafood choices. In addition, the zoo offer financial support to the Wildlife Conservation Society for Sharks and Rays Conservation.